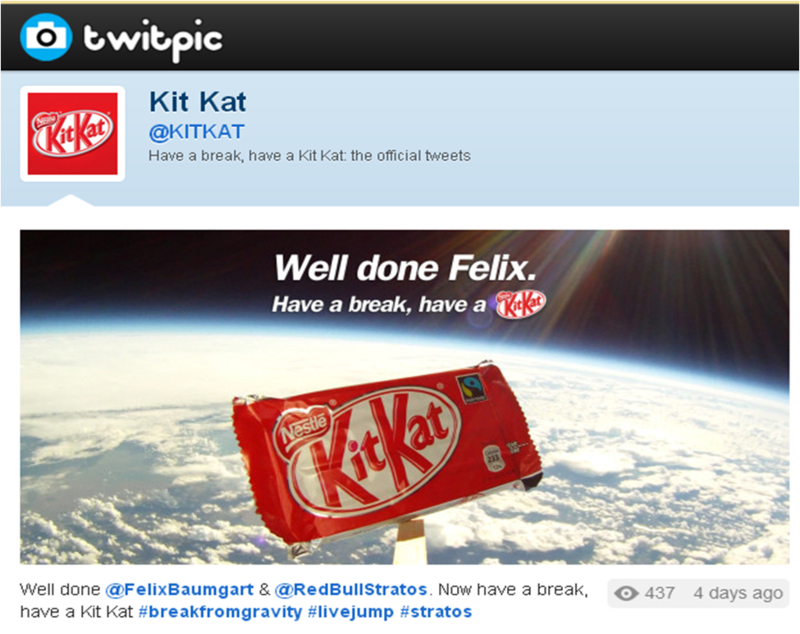 Following trends and piggybacking buzz is a productive way of producing Earned Media and Kit Kat followed this route by producing some fun activity around Felix Baumgartner's supersonic freefall. This was a popular post on the Kit Kat Facebook Page with 1544 Likes. Then two days later, 'inspired by Felix Baumgartner and the Red Bull Stratos space jump', Kit Kat 'launched into space' using a balloon and a camera. Being topical is hard as it requires fast turnarounds and processes / structures have to be in place to facilitate. Tactical activity in response to real time buzz can be a great way of creating engagement / conversation though and in this case a simple stunt provided interesting video and photo content, connected across platforms - crucially with the key brand message of 'have a break' central to everything.